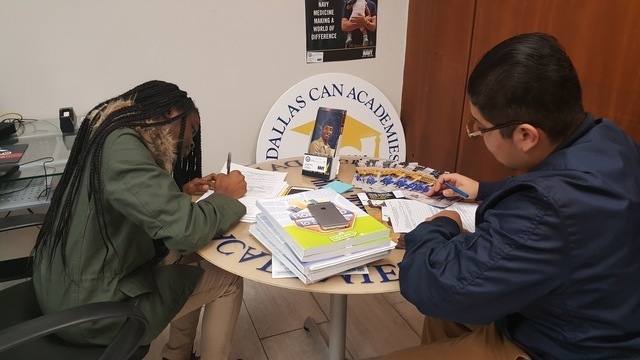 Texans Can Academy – Dallas Oak Cliff is providing students the opportunity to earn college credit while attending high school through dual credit courses. The school began the program in conjunction with Richland College last year and has already enrolled 25 students for the Spring term. Through the program, students have the opportunity to earn high school and college credit in a series of Career and Technology courses such as Business English, Introduction to Keyboarding, Microsoft Office and more. The courses are offered to students at no cost and benefit students by allowing them to save money on college tuition, graduate from college earlier, pay tuition for fewer classes and enjoy an easier transition to college-level coursework and college life. Richland College is one of the seven independently accredited colleges of the Dallas County Community College District. The college hosts an orientation to help students with completing college enrollment forms, receive ID cards and participate in freshman orientation information sessions. Once the students complete the dual credit classes, course credits are transferable to all Texas public colleges and universities and to some private and out-of-state institutions. Twenty students at Texans Can Academy – Dallas Oak Cliff have already earned college course elective credits through the dual credit program.